Veronica scores to put Mexico in the Women's World Cup Finals! Former player and current coach at PSV Union FC Veronica Perez made world soccer history on November 5,th 2010 scoring the winning goal of the game as the Mexican Women's National soccer team defeated the USA Women’s National team in the 2011 Women's World Cup qualifying game. It was the first ever victory for Mexico vs. the USA and the first time the USA had lost in a qualifying game for the World Cup and considered the biggest upset in the history in women’s soccer history. As a result, for the first time, the #1 ranked USA Women's soccer team was in danger of not qualifying for the World Cup. As a result of this surprise loss, the USA then had to beat Italy home and away in playoff matches to make it to the World Cup Finals, where they eventually lost to Japan in the World Cup Final. The win by Mexico over the USA is a milestone in global women's soccer and even more profoundly may have helped permanently impact global women's advocacy in sports. It changed the landscape of women's soccer forever. Q: Do you practice a lot? Q: What type of training do you do? A: Depending on what I'm training for and what my schedule is - sometimes physical fitness in the morning and/or fitness with the ball at home in back yard on driveway or local park. In the afternoon i work with the ball on very specific exercises. Right now i go to the field and work with Gary and Carine Ireland at PSV Union and either do the exercises they show the players and sometimes demo them for the kids. Q: What are you specifically working on now? Anything in particular? A: Right now I'm working a lot on my individual game. When I'm not training with the national team I go home and work on specific aspects of my game because its hard to do when trying to get a team prepared. Getting hundreds of touches on the ball daily and mostly dribbling right now. I want to bring that more into my game at the international level. Carrying the ball from the midfield and attacking the space in front of me, breaking through the opponents defensive lines. Q: What about when you were a teenager before college. Who did you watch then? Q. Do you watch soccer on TV? A: Approx. 4 games per week or watch videos on www.pass2me.com where i visit the homework page. Q. Do you watch individual players? A: I try to put myself in a players' position when watching film/video of a great player; what they do off the ball; If they have tendencies to receive with a particular part of the foot or body; the direction they turn and how they do it. Q: What do you like about these favorite players? A: They always play with a purpose They can play short and long any time. Not selfish but they know when to take it themselves. Q: Do you watch women's soccer? A: I watch the best level possible which is Barcelona, and payers like Messi and Xavi and Ozil. I do on occasion but it's very rare. I watch if there's an international game on or if my friends are playing i watch to support them, just like they do for me, but honestly I watch men's soccer. You can only learn by watching the best in the world. Q: Who is the best player you've played with while professional & World Cup? A: Miyama from Japan. I played with her in St Louis before she went to LA to play. She is small and mobile and has the best touch. She is deceptive, a hard worker. Always stayed late and arrived early. Q: Where did you first start to have an interest in becoming a serious/committed soccer player? A: When i was 12 years old i did weekly and sometimes twice per week small groups with Gary Ireland, Simon and Carine Ireland. I also stayed behind after practice and worked on the skills they taught me. I then started to self train at home to work on the material i was being taught, something which i remembered and took with me to college. I see the kids working on the "Skill Ladder" that was devised by the coaches and i think 'hey, i did that too!' and i still use it today. When other players at college didn't train on their own and the coaches werent around i would try and teach my teammates at UW. Q: Did anyone push you to become a better player? A: My coaches (Gary, Simon and Carine and Lesle Gallimore at UW). When I was 12 or 13 i was scared to get out of the car when i came to the field on the first day at PSV Union. My dad made me get out of the car so i have him to thank me for that. Q: How many could you juggle at 12? A: A few hundred. Wasn't mandatory until i got to PSV Union and worked with my coaches who showed us hundreds of ways to juggle. Q: Did juggling help you? Q: What are your favorite exercises or training routines? A: Soccer Tennis, playing against a wall. 1v1 or 2v2 when you go out with friends. Shooting repetitions on my own or with a friend because you can incorporate anything before you shoot. Q: Who were the best teams you have faced? A: Japan in the World Cup and France in October 2011. They were all highly technical and all on same page. They were skillful but tactically intelligent players. Q: When you coach at PSV Union do you ever think that maybe some of the kids might follow in your footsteps? A: Yes- I like to go back to my roots and show the kids what I've learned and help them out - I enjoy coming back and playing with the kids and teaching them. I cant imagine coaching or going anywhere else. Q: What game format do you think makes you better? 1 v 1; small sided 5 v 5; numbers down 3 v 5; 11 v 11; 7 v 7? A: Personally I love playing small sided games. Also i prefer playing down 3 v 5 for many reasons. Less people so more touches on the ball. You have to be engaged at all times because you don't want to let down your teammates. You can be creative individually but also create some really great combinations with the other 2 players. And you have to constantly be communicating on both sides of the ball but more defensively. It's extremely tiring so you get fitness too. It's a challenge but you don't get better by having things be easy all time. You have to work for it. Q: If you were to rank your preferred games, what would they be and why? Q: Do you see Mexico improving in the next few years? Why do you think Mexico is starting to do better? A: Yes. We're getting back to playing more with the ball and thinking quicker. Our coaches want to spend more time on technical parts of our game. It's important for us to be organized, disciplined and fit but we all have to be able to feel confident in every pass we play, how we dribble, controlling the ball. We should all want the ball because were confident of our skills. Also I've never been to a camp where he hasn't mention what type of player succeeds the most on the field. And that's the player who is thinking, reading the game and has a good concept of what's going on around them. Q: How would you spot talent? We have a culture of showcasing players on big fields, 4 games a weekend; playing very vertical soccer here. If you were to scout a player right now would it matter to you where you found them? What characteristics would you look for in that player? A: I would look at their body language first. I would try to see if they are engaged and interested. Do they look like they want to learn or just pretending. Can they juggle? How quickly they pick up on things. It wouldn't matter where I saw them. You can find talent anyway...training alone or with a group...at a park, street, game, pick-up, anywhere. If I saw them self-training that would tell me a lot as well. But again it couldn't be lazy. I would want to see effort and how particular they were about the material they were working on. A: Speed is very important. But I'm not talking about pure physical speed, for example how fast you can run 40yds, or a mile. every play has to be fit but not necessarily fast. Speed of mind however is needed by ALL players. Speeds: without ball, thought process, reading of the game, speed with the ball, acceleration/deceleration, finding solutions to a problem on the field, etc. My advice to younger players is the physical part of the game will come. It's the easiest part of the game to improve. Work on your technique and knowledge of the game at a younger age. It takes years to learn and develop these skills. If you can control a ball, control your body, read the game at a young age I guarantee you'll be better off when you're older (and keep training/can't stop) than the players who just worked on fitness and tactical aspects so they could win games. A: Aya Miyama, Homare Sawa from Japan and the France National team. My toughest competition was playing on the tennis courts or small-sided games at a field against my coaches Gary, Simon and Carine Ireland and Chris Sullivan and older players when i was younger. I hardly ever touched the ball because i couldntget ti. My team would have more players and if we finally did get the ball we would be so happy if we could connect one pass. Q: You train with the kids at PSV Union, some of whom are very young. You and Carine do amazing things on the field vs the girls but do you get anything out of the games? How do you improve with younger players? A: Yes some of the players are very young and if you were an outsider you might just see these two coaches keeping the ball and pulling off all these moves but it's hard. We usually have half as many players and we're constantly working and moving with a purpose. We keep the ball to work on our skills. We want to figure out solutions on how to get out of crowded, compact spaces. Then we also try to combine with each other, finding little slots in the defense. And then if we lose the ball we try to win it back as fast as possible. First because they took it from you (smiles) then because it's more tiring to start back up again if we have to defend for a while. Which we try not to let happen! I definitely improve playing with younger players. It's also the effort you put out. If I just jogged around and didn't care then no I wouldn't get anything out of it but since I play against them like I would if I was training with my national team I get something out of it. It's fun. I used to be that little kid chasing around the coaches too! 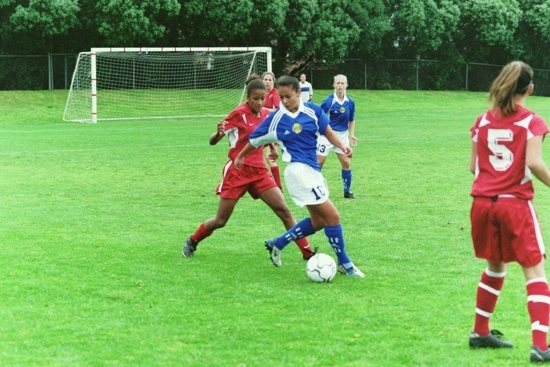 Veronica has traveled to China, South Korea, Canada, Mexico, Brazil, Germany, Martinique, Seweden, Colombia, Cyprus playing in the CONCACAF Olympic and World Cup Qualifiers, World Cup (Canada & Germany), Peace Cup and Pan Am Games.